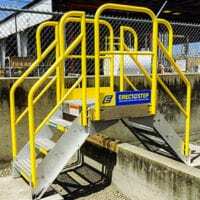 SafeRack's patented access gangways and loading rack systems and equipment are designed for maximum safety, ergonomics, productivity and lower maintenance. SafeRack railcar unloading and loading platforms and gangways offer unparalleled flexibility and versatility. SafeRack truck access gangways are engineered to articulate and self-level, adjusting to varying vehicle heights. 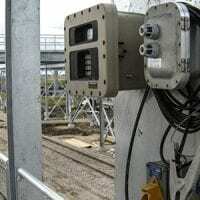 SafeRack makes loading and monitoring petrochemical and other harsh liquids safer and easier. 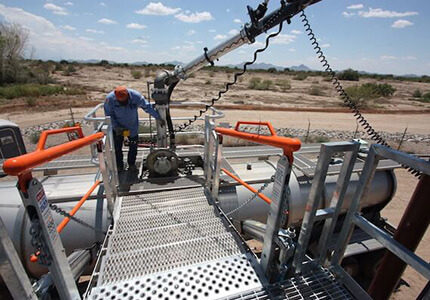 Industry-leading remote loading and unloading equipment. SafeRack's complete range of railroad track pan and spill containment systems. Our SPCC and EPA compliant Polyethylene and Metal railcar track pans are used globally and protect from accidental railcar spills and chemical spills at rail car wash facilities, railroad tank car loading areas, and locomotive fueling stations preventing costly cleanup and regulatory fines. Portable, effective and easy-to-use containment solutions for the trucking industry. We offer everything you need to keep loading terminals and industrial manufacturing plants safe and productive. TODO couplings help eliminate safety, environmental and human error issues. And they utilize a simple bayonet design to allow for faster connections - regardless of connection type. So not only are the couplings safer, but they're more efficient, as well.